As my developed areas have grown, so has my ability to observe the vast array of arthropods and vertebrates with which I share my acreage. Perhaps this is because my plantings are diverse, offering a wide variety of seeds, fruits and flowers. 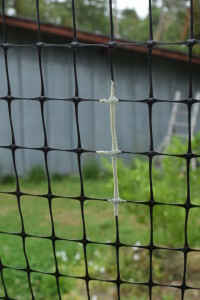 Perhaps it is because much of what I plant is understory vegetation that lets me move freely among plants in a way that I cannot with the overgrown forest understory that occupies much of the rest of the property. Certainly I’ve added more surface structure (wood, rock, metal, glass) than was here before. And there is more sunlight from the removal of trees behind the shed and barn. All told, I tentatively put forth the idea that I have increased habitat diversity by planting far more native and non-native (PNW) species than were ever here before (by 100 fold I would guess based on my plant list), increased the amount of forest edges, improved lighting, and provided more habitat structure, both living and non-living. 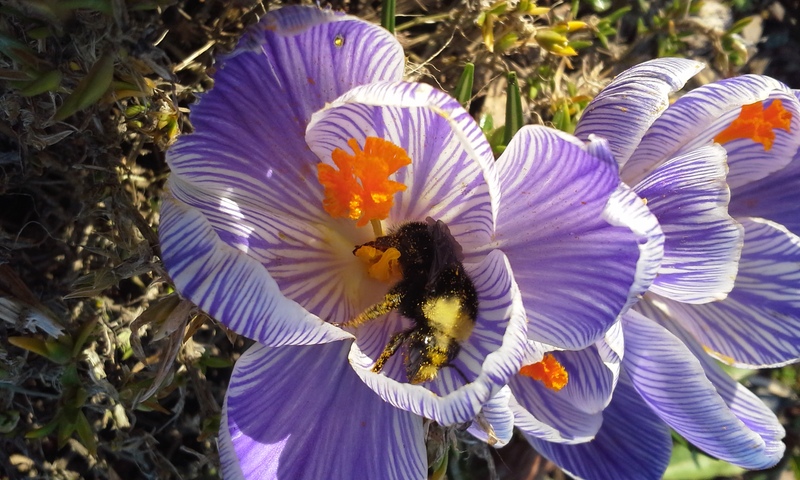 My efforts have certainly brought forth a host of birds that enjoy the yard in front of the barn, but invertebrates are easier for me to photography, and have been a life-long interest of mine. 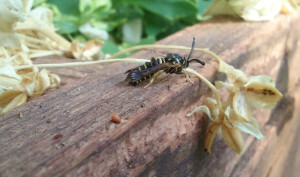 The raspberry crown borer, a mere 3/4″ in length, resembles a wasp but the ‘fuzz’ on the first few segments of its abdomen and feathery antennae give it away. As the name implies, the larvae feed on raspberry roots and may explain the sudden death of some of my red raspberries. 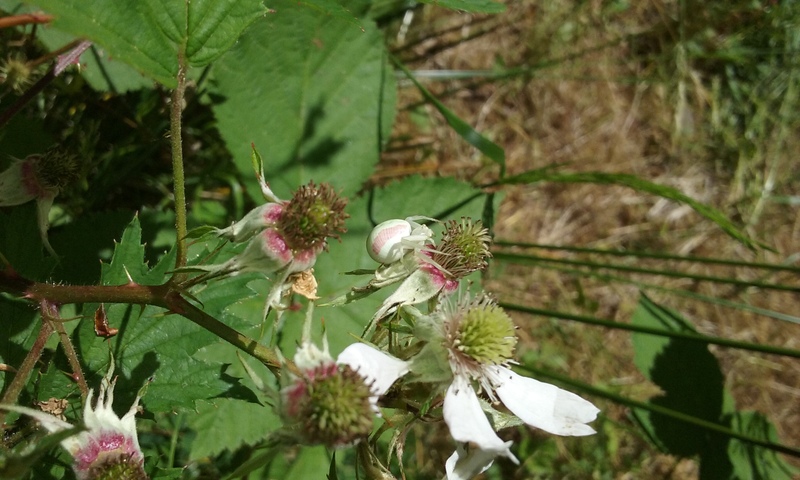 This flower spider (likely Misumena vatia), blends in almost perfectly with late-summer blackberry flowers, bearing the same white and pink coloration. 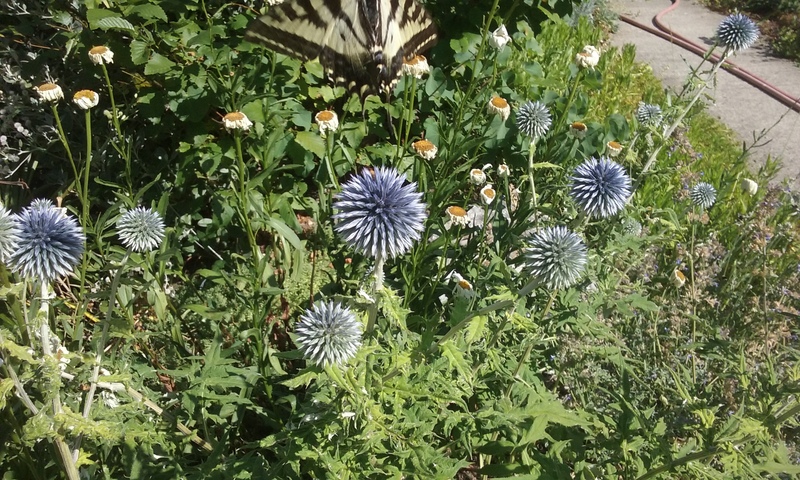 A pale swallowtail just leaving my globe thistle. 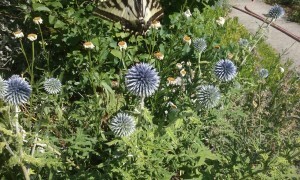 I love these plants, and hope my avian foragers will too. Eggs on my deer fencing are a common occurrence in late summer. I am assuming they are butterfly eggs, but I’ve never seen the parent organism. 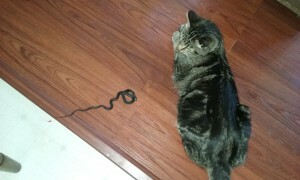 Milo, my little male tabby, shows of the live garter snake he brought into the house. I released it and Milo quickly forgot about the whole incident. The relatively dull dorsal view of a male Western fence lizard, courtesy of Milo the cat. It lived, and I released it to a small rockery. 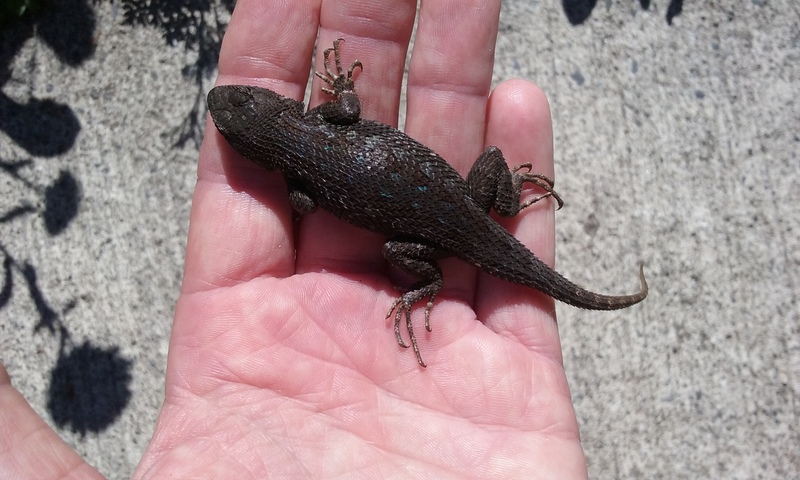 It is interesting to note that these lizards are comparatively rare in Western WA, occurring primarily in coastal areas, including Fox, McNeil, and Ketron Islands. In SoCal, these animals are much lighter in color as is typical of species in southern vs northern latitudes. 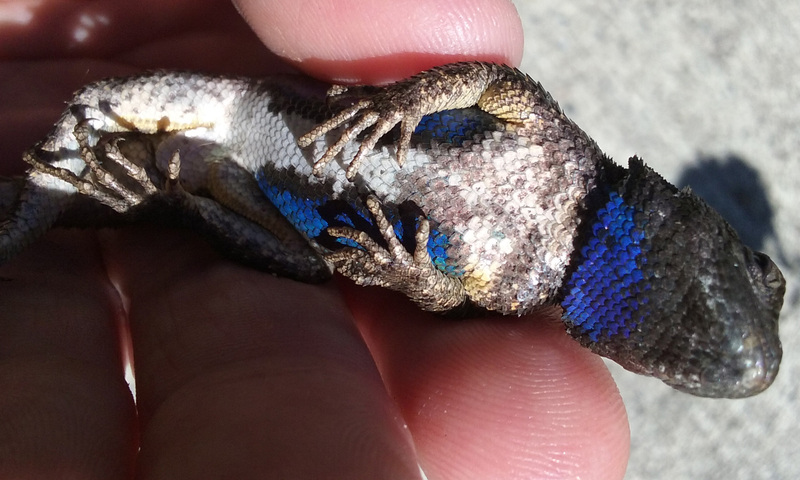 The brilliant indigo underparts of the male Western fence lizard.